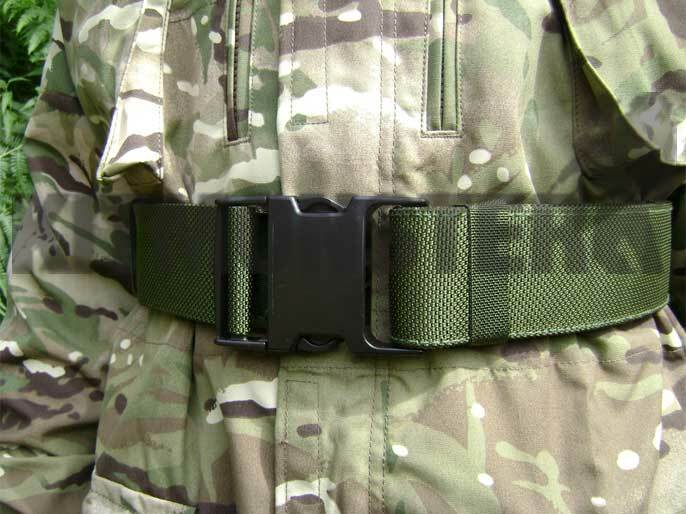 Genuine British Army PLCE Issue Belt with standard 'Nexus' quick release buckle. New, unissued condition belts in size Large. These fit waists up to 46" (absolute maximum size) we also have size Medium available, please see separate listing. Olive Green nylon with 'pockets' for PLCE pouch tabs, metal yoke fittings and metal ended size adjuster. Suitable for use with most webbing systems including; PLCE, MOLLE, 58 and 44 pattern but not ALICE (the ALICE clips are too small). Please consider Hip Pads, Clothing and Body Armour when selecting your size.